Whether you gave good, fair, or bad credit, we put together a list of personal loans for all credit types. You can also use an unsecured personal loan to consolidate other debts and receive a better rate of fixed interest. The interest rate available to individuals greatly depends upon their past credit history and credit score. If you currently have high-interest debt, like credit card debt that carries a rate above 15%, a great and quick way to lower your interest rates is to apply for a 0% rate balance transfer. 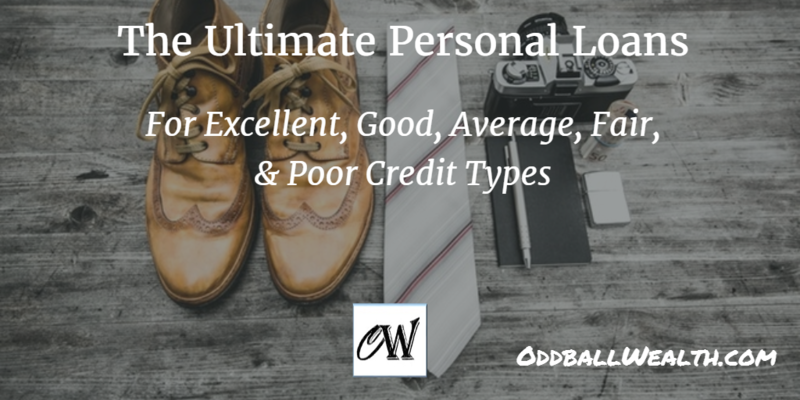 The Best Personal Loans for Good, Average, and Poor Credit. Good credit makes borrowing easier. Great credit makes borrowing downright cheap. Here’s where to get the best terms if your credit is good. Then if you can’t pay it off during that intro period of time, you can find another bank or lender offering a similar promotional offer and roll your balance over again. This can be easily done as long as you keep your credit in good standings. If you’re not sure what your credit score currently is, Experian lets you quickly view your FICO Score and will give you a copy of your credit report for just $1. Although, balance transfers work great for some people, they’re not for everyone. It can be difficult for individuals with poor credit to receive approval for a balance transfer. Also, a balance transfer wouldn’t help someone looking to borrow new funds. Personal loans are great for a variety of things, including paying off other high-interest debt, paying for college or higher education, buying a new car or boat, family vacations and traveling, remodeling or updating your home, starting a business, unexpected expenses, emergencies, and much more. Thanks to more online lenders and increasing competition in the lending industry, they are now are more attractive deals than ever before that you can take advantage of. Quick Note: To check rates, apply for multiple loans. By applying for a loan at different companies individually. Unlike credit card companies, many personal loan lenders will let you see the rate you could get without harming your credit score. They’re able to do this by performing what’s called a “soft credit pull“. When you give the lending company your social security number, they’ll do what’s called a “soft pull“, which I also stated above. This is a great way to make sure you secure the best rate available, by applying to a couple of different lenders and accepting the offer with the best rate. Currently with interest rates being low, banks don’t like giving out personal loans because of their small profit margins and they push credit cards instead. Thankfully, new lending companies offer highly competitive rates even if you don’t have the best credit, and they won’t try pushing a credit card or other products on you either. You can also receive a better rate from an online lender. This is because online lenders have less overhead and expenses than traditional brick-and-mortar lenders, allowing them to pass the savings on to you! Below, you’ll be sure to find a lender that suits your criteria and get you the loan you need. Many have no penalties for late payments and don’t have an income requirement. No matter your credit history or credit score, below you’ll find lenders for people with excellent credit, good credit, average credit, poor credit, and every type of credit in-between. It’s also important to note, that if you currently don’t have the greatest credit in the world, getting a personal loan and making regular on-time payments on the loan is an excellent way to improve and build up your credit and credit score! To make it as simple as possible for you to find the loan you’re looking for, through time and research, we found the absolute best lenders that offer hands-down the best personal loans and rates. To make your search even easier, we categorized the lenders into five categories, which include the best personal loans overall, the best free loan match making services, the best unsecured loans for excellent credit, the best personal loans for average credit, and the best short-term loan lenders. The places to get the best personal loans overall are listed below. These are some of the biggest and most well-known lending companies in the industry, and they’re also known for having the best service, rates, customer experience, and getting borrowers the funding they need quickly. Lending Club, a peer-to-peer lending giant, which connects lenders with borrowers, is the largest P2P lender in the marketplace. An early pioneer of the peer-to-peer lending platform, Lending Club played a big key role in revolutionizing the lending industry, by cutting out the middle man (banks) and connecting borrowers directly with lenders, dramatically simplifying and speeding up the application and approval process, and quickly getting borrowers the funds they need and desire. Even though most P2P lenders offer personal loans, Lending Club is the largest P2P personal loan provider for a couple of reasons. One reason they’re the largest P2P personal loan provider is because of their below industry level low interest rates. Another reason, is because of their loan options and flexible terms. Although, a big key reason for why they’re the largest P2P lender, is for the user-friendliness, user-ability, and easy navigation of their website, simple lending process, and their outstanding customer support also plays a big role. Lending Club is also the largest peer-to-peer provider of business loans and currently one of the only P2P lenders that offers business loans. Peer-to-peer lending platforms, like Lending Club, have become extremely popular and convenient alternatives to the time-consuming and complex lending procedures used by traditional banks. Traditional lending practices that are used by banks, generally require borrowers to physically drive to the bank, wait and talk to a banker (who will usually try and get you to sign up for additional financial products and services they offer), fill out a lengthy application, and then make you wait to find out whether or not you’re approved for the loan. A huge reason why Lending Club has become so popular and why P2P lending has been such a big success, is that they’ve eased and simplified the entire lending process, allowing borrowers to avoid the complex and lengthy lending process traditional banks use. Now, within minutes and the click of a button, borrowers are able to apply for a loan, get approved, and have the funds deposited into their bank account directly from their computer or mobile device, without ever having to leave the comfort of their home. Lending Club provides personal loans of up to $40,000 and requires borrowers to have a minimum credit score of only 600. They offer low and competitive interest rates on their personal loans which currently have an APR range of 5.99% to 35.96%. When reviewing your application for a personal loan, Lending Club also takes other factors into consideration, such as the debt-to-income ratio. Lending Club currently does business in every state except Iowa (sorry Iowa residence!). Its personal loan terms range from 3 years to 5 years, with the exception for borrowers with really good credit to whom they’ll provide 2 year loans for. They do charge an origination fee of up to 5%, and will also charge a fee to process checks. Why Lending Club? As previously mentioned Lending Club is one of the original pioneers of peer-to-peer lending, and they’ve played a huge key role in revolutionizing the lending industry by greatly simplifying the application and approval process. They offer very competitive interest rates, a wide range of loan options, good terms, and are very transparent. If you think Lending Club is a lender you might be interested in getting a loan with, quickly go and check to see what rate you would qualify for. It only takes a few minutes to find out your rate, and you have nothing to lose by doing so. Lending Club uses a “soft credit pull” meaning it won’t have any impact on your credit score. PersonalLoans.com is an outstanding personal loan service that matches consumers with the perfect lender and loan, by utilizing their very large network of lenders. Based upon your personal circumstances and needs, you’re able to get a personal loan in the range of $1,000 to $35,000. The loans they offer have low APR, ranging between 6% to 36%. Since Personal Loans is a loan matching service, borrowers have many more options to choose from than if they only applied for a loan with a single lender. They’re able to quickly and efficiently match you with the perfect loan that meets your needs. Compared to many other lenders, Personal Loans offers borrowers much greater flexibility and options when it comes to choosing a loan and lender. They’re able to offer a more wide range of funding, by utilizing their large network of lenders. Trusted Personal Loans is not direct lender, but instead like PersonalLoans.com, they match borrowers with the best lender using their very large network of lenders and loan providers. Their 100% online process, is one of the safest and most convenient ways for consumers to find the exact loan they’re looking for that matches their needs. Loan amounts range between $500 to $10,000, and provide borrowers with next business day funding, allowing you to get the money you need fast. APR ranges are based on your credit score. The terms of the loans offered range between 2 months to 60 months. You can read the full Trusted Personal Loans review here. Avant is great for place to people who are unable get a decent loan rate elsewhere, allowing consumers to borrow between $1,000 and $35,000. Avant will even borrow money to people with poor credit. Their typical borrowers have credit scores that range from 580 to 700, with APR’s ranging from 9.95% to 36%. They also don’t charge any origination fees on their unsecured personal loans. Avant personal loans are currently available to consumers in every state, except Iowa, Maine, North Dakota, and West Virginia (sorry guys). Why Avant? You’re able to get a loan up to $35,000 even if your credit isn’t in the best shape. Even though the APR isn’t as low as some of the lenders listed above, it’s still considerable low for an unsecured loan. You’ll be able to receive your funds extremely quickly and they have very flexible terms. NetCredit allows consumers to borrow money from $1,000 to $10,000. Like the lenders above, you can see your rate and how much you qualify for without it affecting your credit score. Their loans are also a good way for individuals with poor credit to begin improving and building up their credit. Short-term loans, sometimes referred to as payday loans, are normally small-dollar amount loans that are offered quickly, generally instantly. You should only get a short-term loan if you absolutely have too, and other options are not available. I do not recommend getting a short-term loan, and they should only be used for emergencies and unexpected expenses. You should not get a short-term loan to pay for large expenses, such as a home or car. Instead, you should use cash you already have or try getting a loan from a lender above to make such purchases. Also, it’s generally a bad idea to take out a short-term loan or payday loan to pay off existing debt you have, because short-term loans and payday loans usually carry higher interest rates. Instead, you should get a loan with a lender listed above, as those loans generally have much lower interest rates and longer term lengths, making the lenders listed above good strategies and much better options for paying off any existing high-interest debt you have. If you’re having trouble making payments on any current debt you have, you may only make your situation worst by using a payday loan to make payments on other debt. If you’re using debt to make payments on other existing debt, you should consider seeking assistance to settle your current debt before taking on more debt. Short-term loans usually range from $50 to $1,000, and have less qualifications and are much easier to get approved for and acquire, than normal conventional loans. Another thing to keep in mind is generally short-term loans carry much higher interest rates than regular personal loans. Check into Cash is probably one of the most well know national short-term lenders. They have been helping consumers get cash quickly for more than 22 years. Depending on your state of residence, you can borrow from $50 to $1,000 with a short-term Check into Cash loan. You can get cash fast by simply filling out their easy online loan application. Check into Cash short-term payday loans are currently only available in the following states: AL, AK, CA, HI, ID, IN, KS, LA, MO, MS, NV, OH, OK, SD , TN, TX, UT, WA, WI, & WY. Since 1997, CashAdvance has helped millions of consumers get a loan, and has been a trusted resource. They’re superior customer service, trusted brand, and security make them unique from many other short-term loan lenders. CashAdvance is a free loan matching service, which matches consumers with the appropriate lender. You’re only responsible for the fees that come after you agree to a loan from an approved lender you’ve been matched with. After you fill out the application you’ll be matched with approved lenders, which you can choose from. CashAdvance free matching service works with a huge network of short-term lenders, to find a lender and loan that’s suitable for you and fits your personal criteria. Check City Loans has offered short-term financial solutions to consumers since 1989. You can apply for a short-term loan by filling out their easy and secure application. They have many customer service options and flexible loan payment options. Before Check City provides you with a loan they make sure you know and understand the loans terms, process, and risks. If you choose to get a short-term loan with Check City, you’ll be able to receive funds quickly. Identification proving you’re who you say you are. Such as a driver’s license, state ID, social security card, or passport. Documentation of your past income. Such as bank statements, pay stubs, or tax returns. Address verification. This can normally be any recent mail you’ve received with your name on it, a utility bill, lease statement, or mortgage statement. After you’ve given them all the information and documentation required, you’ll have to state how much you want to borrow and how long until you want to pay it back. It’s important to keep in mind that the longer the life of the loan, the more you’ll pay in interest over the loans life. By only borrowing the amount you need, you’ll be able to keep the costs to a minimum and more money in your pocket! I’ve been thinking about getting a personal loan for updating our kitchen and been considering using a peer-to-peer loan such as Prosper. Thank you for the informative article! This is great info! It’s really important to understand how debt and credit really work if you’re interested in getting a loan, or even just maintaining healthy finances. Awesome overview! Thanks so much for all the help! I used to be very pleased to search out this internet-site.I wanted to thanks in your time for this glorious read!! I undoubtedly having fun with each little little bit of it and I’ve you bookmarked to take a look at new stuff you weblog post. I’m a little late to this, but as someone who’s about to apply for a loan this guide is beyond helpful. Great read!! Thanks for the tips! Especially re: credit scores. I…I hadn’t actually checked mine yet (whoops!). * First remember to do your research and find the lowest rate – and best lender – you can. Rates are important, but so are things like hidden fees and charges etc. *And second, make sure you try your hardest to avoid some of the common mistakes other people have made. For example, my almost mistake of forgetting to check my credit score…won’t be making *that* one again. Thanks again! Fingers crossed my application goes well.. Whenever you decide to borrow money whether it is to pay the bills or buy a luxury item ,make sure you understand the agreement fully. Know what type of loan you’re receiving and whether it is tied to any of your belongings. UAE is good place where you find personal Loan and credit card easily but now bad credit history is main issue now days. Thank you for putting all of these sites in one article. Excellent job. bad credit score can be a thing of the past,if only you can reach out to freedom_hacking at hot mail dot com.i just got out of bankruptcy and a need to purchase a house is my utmost priority.During the seasoning period i came in contact with freedom ,was told by few Lenders, that i will be waiting for 1 year plus for FHA loan.i have a saving and a very poor credit score of 511 and two credit card debts from 3 years. The only option i had was to repair my score because ,i cant afford to pay higher interest rate and wait that long.Hiring freedom to fix my credit score rocketed my FICO score to 790 and cleared all credit card debts in a stipulated time as promised.I just got approved for a loan of $190,000 with less interest rate compared to when i was in financial situation. Very useful information on this article i really like it specially”Interest rate grows as the loan extends”Borrowers can lose their asset” Borrowers are triggered to make hasty decisions” Borrowers are charged with higher interest rates”Ask for referrals”Ask about interest rates”each and every step of procedure is very easy.I also recommend to read about payday Loans facilitates residents in United States of America to apply for instant cash loan along with the most feasible process of loan approval within a day. Our service to help find the best funding option to help grow business. Ohh wow! very informative post, well explained about how debt and credit really work. Thanks for the information and please keep sharing, we would love to read more. You have written a very informative article. Thank you for sharing these websites. Keep up the good work!